Aurora is a uniquely skilled piece of science fiction. Robinson blends hard science fiction with a distinctive voice and a fascinating premise. As a result, the story flies by quickly, despite what might otherwise be a slog. Aurora is a story about a colonization expedition sent out from the solar system. After a 170 year journey, the two thousand people aboard the space ship are nearing Tau Ceti, a nearby star system with an earth analogue planet. Their ancestors took off generations ago to colonize the moon they would call Aurora. But the ship is falling apart, there’s a noticeable regression among the ship’s population, and tension is becoming ever greater. The ship’s population is about to hit the boiling point. The story is told from the point of view of the ship’s AI. Devi, the chief engineer–in function, if not in name– has slowly been working on the AI’s self-reflective capabilities and charges the AI with telling the expedition’s story. This is one of the most well executed parts of the book. The AI grows over time. So, while the story has a consistently “non-human” feel, and there is an almost overwhelming amount of technical information, there is also a clear growth in the narrative style over the course of the book. It’s a slow growth, but it’s obvious and the ship incorporates certain stylistic changes into the narration. I found it to be very well done and likeable. The plot is very slow. The story is recounting, after all, a very slow process. Colonization attempts are by their nature slow, especially when you consider the technical aspects of it, which Robinson does. The pacing is also a side-effect of the narrative voice. The AI struggles to convey the same sort of drama that the same story in the hands of a human might. The story may be slow-going at times, occasionally sprinkled with moments of panic, but it’s consistently detailed, extremely rich in thought, and always interesting. There’s a distance between the narration and the characters. It’s told from a kind of familiar outsider’s perspective. As a result, the story doesn’t convey all of the immediate emotional changes that the characters are going through. Again, this is a limitation of the AI narrator who cannot really speculate outside of themselves. This improves as time goes on and as the AI becomes more advanced. The characters remain at a distance, even those of whom the AI is fond. The character growth was a bit dissatisfying. The main character is, in a sense, the AI whose philosophical dilemmas are more of the emotional crux of the book. The population takes on a secondary role and suffers for it. Overall, though a weakness, it wasn’t dislikeable. I found that I really liked the development in how the AI presents each character’s growth as the level of reflectiveness in the AI changes. My biggest complaint about the book is actually the ending. There’s a lot of political strife midway through the book and an internal splintering of the population occurs. This was interesting to say the least, but there’s little follow up on some of the factions post-conflict. I would have liked to see more. Part of this is due to the limitations of the narrator. However, the last 50 or so pages is told from an omniscient point of view and so, the lack of follow up loses its understandability. Additionally, I thought that the parts told by the omniscient point of view didn’t actually add to the story overall; instead, it detracted a bit from some of the better plot points. Regardless, this is one of my favorite books of the year. It’s fantastic. If you like hard scifi, this is one to blow you away. If you’re more on the emotional-philosophical side of the scifi spectrum, there’s a lot here for you as well. 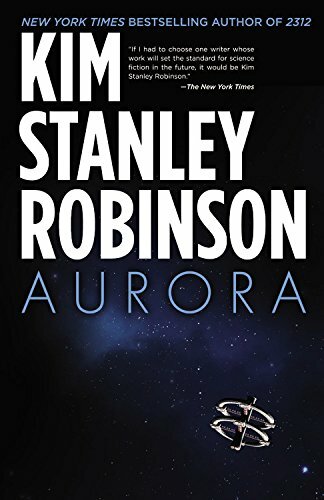 This entry was posted in Reviews and tagged AI, Artificial Intellegence, Aurora, Book Review, Colonization, Hard Science Fiction, Kim Stanley Robinson, Science Fiction.